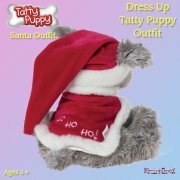 Me To You Dress Up Tatty Puppy Outfit - Puppy Coat - Tatty Puppy will look super smart in this multicoloured Puppy Coat! 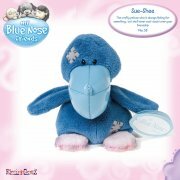 Suitable for ages 3+, Tatty Puppy is the cute lovable pup with floppy ears and blue nose. 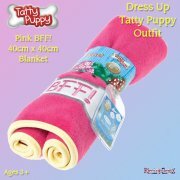 Tatty Puppy will look super smart in this multicoloured Puppy Coat! 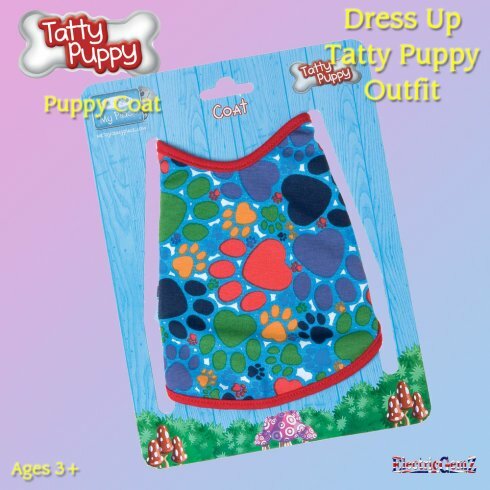 Suitable for ages 3+, Tatty Puppy is the cute lovable pup with floppy ears and blue nose, and this blue coat with blue, red, purple, yellow and green paw prints is made exclusively for it - and there's a matching Cap & Bandana Set available too!. 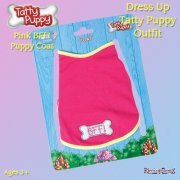 Tatty Puppy's Puppy Coat comes on a backing card and not in a pack, but is brand new and has an official Carte Blanche Tatty Puppy tag. 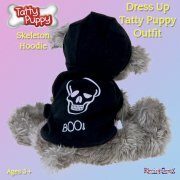 This is an accessory pack and does not include Tatty Puppy. 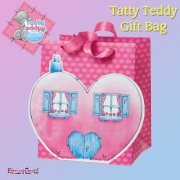 It is not suitable for Join In and Play Interactive Tatty Puppy. The full range, including outfits and accessories is available separately from ElectricGemZ. Search for Tatty Puppy in the box above.